Chattanooga State Community College unveiled a new, state-of-the-art construction lab Wednesday morning (pictured above) that will provide students with more hands-on learning opportunities. The lab includes multi-functional spaces such as a computer lab, lab tables for mixing materials and it will also include a "tiny home." Dana Nichols (left), vice president of Academic Affairs, and Jimmy Lail (right), board chairman of Associated General Contractors of East Tennessee, pose for a picture with other school officials and AGC board members inside the new construction lab at the school's Center for Engineering, Technology, Arts and Sciencees (CETAS) building. The lab was built thanks to a $150,000 donation from AGC. Chattanooga State Community College unveiled a a new, $150,000 construction lab Wednesday morning that school officials said will provide more hands-on learning opportunities for students wanting to enter the construction industry. The lab was built thanks to a donation from the Associated General Contractors of East Tennessee and is housed in the college's Center for Engineering, Technology, Arts and Sciences (CETAS) building. Several people, including school officials, AGC members, city officials and Tennessee Board of Regents member Tom White were there Wednesday for the unveiling of the space, which is opening in August and is a multi-functional room that includes a computer lab, lab tables for mixing materials and a "tiny home." Lyn Potter, interim dean for the engineering technology college, said students will be able to design and build their own tiny homes in the 4,900-square-foot lab. "It allows them to take a construction project from nothing to the finished product," Potter said. Before the AGC lab, there was no dedicated construction lab on campus and equipment was spread across three different locations, said Nancy Patterson, vice president of college advancement and public relations. Patterson said it will also allow the AGC student chapter to meet and work on community service projects. Student enrollment was up by 19 percent this past year in the engineering and IT division, Patterson said. She said the college job placement rate for students with a construction concentration was 100 percent in 2016. AGC board chairman Jimmy Lail addressed the audience before the ribbon cutting, stating Tim McGhee, the former interim vice president of continuing education and workforce development in the engineering technology college, helped design the lab. McGhee died in Decemeber at just 53 years old. "He would dearly love seeing this project to its fruition," Lail said. The number of construction engineering jobs in Tennesee is expected to grow by 8.5 percent by 2024 compared with a decade earlier, according to the school's Institutional Effectiveness, Research and Planning Department. 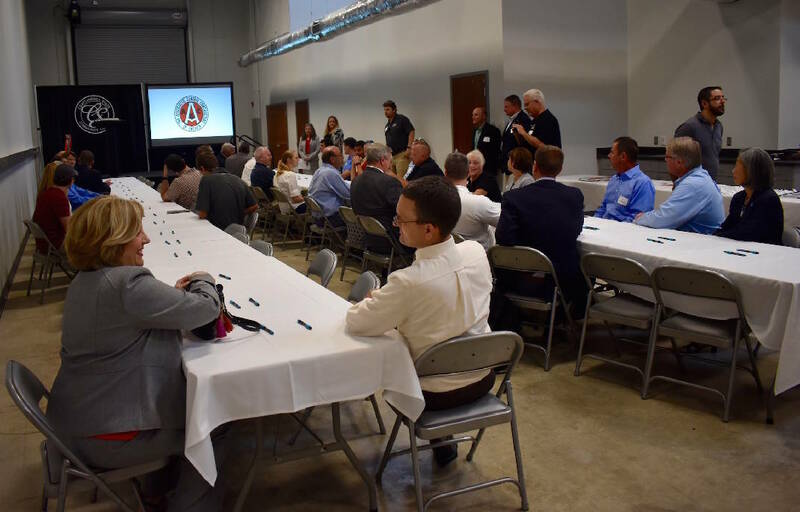 AGC reports East Tennessee is seeing the highest rate of construction growth in the state with Cleveland experiencing a 13 percent increase and Chattanooga seeing 6 percent growth. "There are jobs waiting for everyone," Lail said.